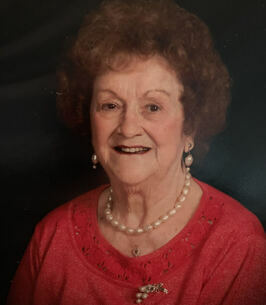 Vilma Anspauch Service Details - Bellefonte, Pennsylvania | Wetzler Funeral Home, Inc.
Vilma Mary (Ivicic) Anspauch, “Mema”, loving wife, mother, grandmother, great-grandmother, passed away peacefully surrounded by family on Tuesday, October 30, 2018. 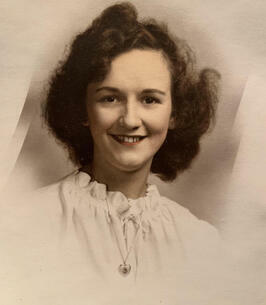 Vilma was born on December 7, 1926 in Bellefonte, Pennsylvania to Matthew Ivicic and Frances Kucas Ivicic. In 1946, she married the late Donald Jones Anspauch Sr.
She is survived by her loving children: Donna M. Neidigh (Terry) of Bellefonte, Sandra K. Kowalski of Bellefonte, Donald J. Anspauch Jr. of West Hollywood, Ca. Grandchildren: Shelia Frankenfield (Gord) of Manheim, Renee Campbell (Doug) of Wellsville, Scott Kowalski (Shelly) of Dillsburg, Gregory Kowalski of Dillsburg, Megan Nelson (Brad) of Pittsburgh. Great-grandchildren: Jacob Nieto (Kyra), Olivia Hale, Hannah Kowalski, Skyler Ramp, Dawson Ramp, Noah Kowalski, Isabella Smeck, Layne Nelson and Wyatt Nelson. She was preceded in death by her parents, husband, and her siblings, infant brother Robert, Joe, Matthew, Caroline, Helen Boscaino, Barbara Thal, Polly Miller, and Anne Haranin. Vilma was a life member of Saint John’s Catholic Church and a lifetime achievement award recipient of Catholic Daughters of the Americas. Self-made entrepreneurs, her and husband Donald headed Valdon’s Big Boy Shop known for their infamous hoagies and hot peppers. Good Fridays were always a tradition in Vilma’s book where she served homemade pierogies to friends, family, and strangers. Her signature presents included silky pillows, handmade Christmas tree skirts, and quaintly decorated Christmas stockings. She also found great joy in jewelry crafting and partaking in many art shows and festivals. A public visitation will be held on Friday, November 2, 2018, from 11am – 1pm at St. John the Evangelist Catholic Church at 134 E. Bishop Street, Bellefonte. Mass will immediately follow at the church at 1pm with Father George Jakopac officiating. Burial will follow at St. John’s Catholic Cemetery, Bellefonte. In Lieu of flowers, memorial contributions may be made in Vilma’s name to St. John’s Catholic School Angel Fund: 116 E. Bishop Street, Bellefonte, PA 16823 or Grane Hospice Care: 106 Zee Plaza, North Juniata Street, Hollidaysburg, PA 16648. On behalf of Vilma, the family would like to thank the staff from Grane including Arlene and Ruth, as well as all the Grane volunteers for their kind and compassionate care given to their mother, grandmother, and great-grandmother. To send flowers to the family of Vilma Mary (Ivicic) Anspauch, please visit our Heartfelt Sympathies Store. We encourage you to share any memorable photos or stories about Vilma. All tributes placed on and purchased through this memorial website will remain on in perpetuity for future generations. My sincerest condolences on this loss of this beautiful woman. Always had a smile and was loved by many. I’d like to express my sincere condolences to all for the loss of your loved one. I’ll always remember Vilma as a beautiful and true soul. Our condolences for your loss. Thinking of your family in this difficult time. Donna and Sandy, I am so sorry to here of your mother's passing, she was a special lady and will be deeply missed. It was always great seeing you while visiting her at Centre Crest. Know that you will always have an angel watching over you.